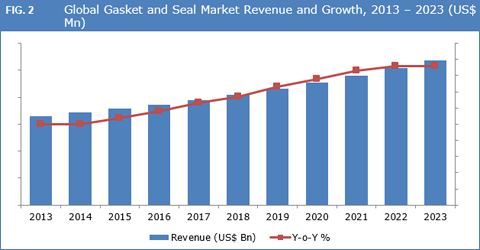 According to a new market report published by Credence Research, Inc., “Gasket and Seals Market (By End-use Application (Industrial Manufacturing, Automotive, Electrical and Electronics, Aerospace, Marine & Rail Equipment, and Others (Energy, etc. )), By Product Type (Gasket (Metallic Gasket and Non Metallic Gasket) and Seal (Body Seal, Shaft Seal, and Molded Seal))) - Growth, Share, Opportunities, Competitive Analysis, and Forecast 2016 – 2023”, the global gasket and seals market is expected to expand at a compound annual growth rate of 5.1% during the forecast period 2016 – 2023. Compliance with stringent environmental standards and regulations is identified as one of the most influential factors driving growth of the gasket and seals market worldwide. For instance, compliance with regulations and standards aimed at controlling toxic emissions and ensuring operational safety by preventing gas and fluid leakage through boilers and pipes is driving demand for gaskets and seals across multiple end-use segments. In addition, resurgence in the manufacturing sector post bleak market conditions prevalent during economic crisis is further expected to support demand for gaskets and seals worldwide. The global gasket and seals market is relatively matured but competitive. The market includes a blend of well-established global and regional suppliers. A well established distribution channel is necessity and manufacturers across the globe are focusing on strengthening their marketing and distribution channel, which, in turn would help them to improve their product position in the market. In developed economies, a dominant trend of market moving towards consolidation can be witnessed as small players are merging operations with well-established players to leverage their resources. Furthermore, the global gasket and seals market being relatively matured is marred by lack of product differentiation. Thus, manufacturers are required to focus and compete on the basis of product innovation, performance and quality, price, and customer centrism. Dana Holding Corporation, ElringKlinger AG, Federal-Mogul Corporation, and SKF Group are identified as the leading gasket and seals manufacturers. Other manufacturers including Boyd Corporation, Parker Hannifin Corporation, James Walker, Flowserve Corporation, LoneStar Group, The Timken Company, Henniges Automotive, Hutchinson SA, Magnum Automotive Group LLC, The Freudenberg Group, and Lamons among others. Strong recuperation in automotive and industrial manufacturing sector is sustaining growth.